During the summer months, many families spend a good deal of time at the beach oftentimes packing a picnic lunch or dinner and spending the entire day there. Having a great picnic blanket made especially for the damp sandy conditions at the beach can make your outdoor beach picnic and day at the beach more fun, comfortable and less messy. Its top is a thin soft layer of polar fleece and the bottom has water resistant backing. It can be machine washed and line dried and measures 58” X 80” when unfolded. Consumers share exceptionally good reviews about this blanket. It is lightweight and has a nice soft top. It is easy to fold, compact, and has a nice little core of padding. Users love the fact that it is machine washable and extremely durable. 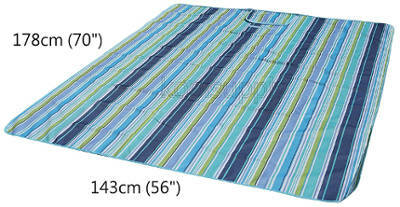 This outdoor beach and picnic blanket measures 7′ X 9′ which, according to the company, is 20% bigger than the rest of the blankets on the market. It is made from high quality 100% parachute nylon material that dries quickly, is strong, breathable and durable. There are also built in sand anchors to keep this lightweight blanket from blowing away on a windy day and even 4 pockets that can either be filled with sand or be used as normal pockets. Apart from them, there is a zippered front pocket to store your cell phone and valuables as well as an integrated stuff sack that has compression straps and is 6 inches X 7 inches. This water resistant outdoor picnic blanket comes in a choice of 4 different colors. User ratings and reviews are exceptionally good with most users finding that it is more useful in the sand than the grass. They like its size and that it is exceptionally lightweight, folds into a compact form and dries quickly when it is damp. You can wash it in the washing machine using a soft detergent and cold water. After washing, it needs to be hang dried. 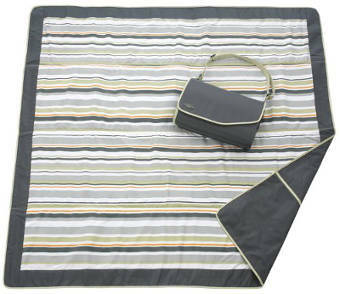 This JJ Cole outdoor blanket is perfect for the beach, park or even concerts in the park. It measures 5′ X 5′ when unfolded and is made of water resistant material with a detachable strap for easy carrying. The sand shakes off from it easily and it can be washed in your washing machine. Ratings and reviews for this product are very positive. Users say that it is ideal for the beach whether picnicking or simply getting a suntan. It can be used in a number of other situations as well. People like that it folds easily and doesn’t blow away in the wind. 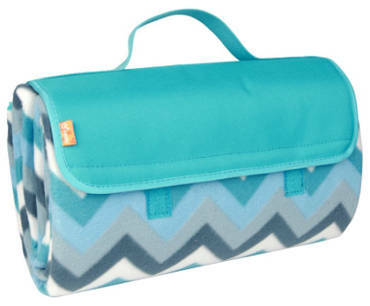 Its handle makes carrying the blanket easier and the side pocket is very handy. The available colors look very nice. It has a waterproof backing and comes with a 180 day money back guarantee. Consumer ratings and reviews are extremely good. 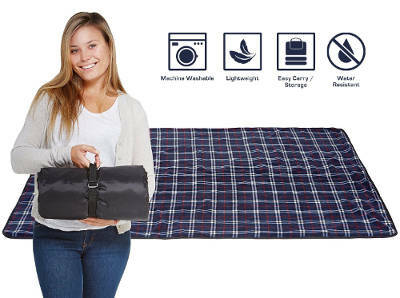 Users find this outdoor blanket easy to fold and carry, and the water-resistant backing handy and useful. It is also durable, versatile and easy to shake off the grass and dirt before placing the blanket back into your car to take home. Finally, people like that it is lightweight and has a soft top. 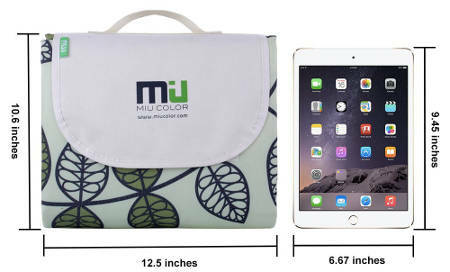 The MIU color foldable large picnic blanket is water-resistant and you get your choice between green leaves on a creamy background or red and blue plaid. In addition, it has a polyester top, a PVC water-resistant bottom and a soft foam middle layer for added comfort. It comes with a 6 month warranty. Users love its waterproof bottom as well as its large size while finding the blanket easy to fold. This Koolsupply beach blanket mat measures 70” X 56” when unfolded. It has a water resistant top and the bottom is both water and stain resistant. It’s also easy to fold and clean. You can purchase it in blue, tent blue, or white tent and the sand shakes off the blanket easily. Product ratings are quite good. Users like the fact that it folds up into a compact form that allows it to fit into the car nicely and that it has a handle for easy carrying. This blanket is extremely practical for outdoor use and it doesn’t feel overly hot even after hours in the sun. 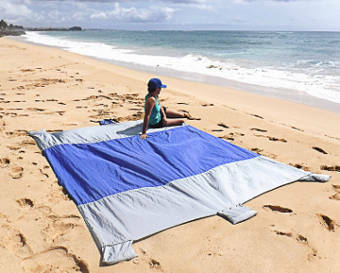 All in all, if you are one of those people who grows tired of taking half a trunk full of sand home after a day at the beach, one of these best outdoor picnic blankets for the beach should reduce the amount of the sand that follows you home while keeping you comfortable when spending a day in the sun.